This is part of two of the series on managing merchant expectations for an affiliate program [see Part One here]. In Part Two, expectations for a launched affiliate program will be discussed and why it is important to make sure the merchant’s expectations are in line with those of their affiliate management team’s. The merchants affiliate program is live, but expectations are still unrealistic; what needs to be done to reign them in? It is all about communicating and educating them on best practices and previous experiences? If I had a dollar for every time a merchant asked why they are not seeing sales immediately I would be pretty well off. Maybe I am exaggerating a little, but you get the point. 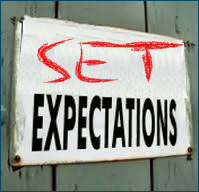 When expectations during the launch phase are unrealistic that tends to carry over to the program once it is live. Merchants must understand that affiliate marketing is different than other forms of marketing in that it takes months, not days to build a successful program. Give it time; asking why there have not been any sales in the first week is not fair. In my post last week “Managing Pre-Launch Expectations of Affiliate Program” I wrote that it is best to give a program 1 – 2 months to gain traction and start producing consistent sales. Many merchants do not understand that recruiting affiliates (either passively or actively) takes time. The process usually includes an email inviting them to join the program, possibly a follow-up email, accepting them into the program, and optimizing them. Depending on the affiliate, this process could take a month or longer. Ensuring your affiliates are armed with the necessary tools to be successful is the most important part of managing an affiliate program. Rushing this process or giving up too soon because sales are not coming through at the pace expected will do more harm than good. Another key to a successful affiliate program is including the affiliate management team as members of the marketing team. This sounds obvious, right? There have been times when managing affiliate programs where merchants have marketing campaigns set up for other channels (email, SEM, Social Media), but do not share them with the affiliate management team, and if they do it is at the last minute and it makes it more difficult to ensure success with the affiliates for the campaigns. The top affiliate programs are successful in part because they treat affiliate marketing the same as the other channels, and that includes aligning their marketing campaigns with affiliate marketing to ensure the most exposure for their campaigns. The strategies outlined pre-launch are being executed and are successful, but something unexpected comes up, what should the merchant do next? The answer is simple – ADAPT. There may be certain marketing campaigns that were not successful with affiliates, so adapting to what is happening around you in critical. Use competitive intelligence (which should be occurring daily) and create similar promotions to that of the competition so affiliates are equipped with high converting deals/promos. Another reason to be open to change is that the merchants website may not be converting well and changes may be needed, so being open to change is not voluntary, it is mandatory. Affiliates, the most valuable asset to your program, may have requests like customized banners, exclusive coupons, sample requests, so being flexible and open to doing things differently than planned will assist in creating a quality affiliate program that quality affiliates will want to join. Set merchant expectations for the affiliate program immediately, so that everyone involved in the management of the program can be given all the necessary tools to succeed and build a program they can be proud of. Your comments/feedback are welcome in the section below. This is part of one of a two-part series on managing merchant expectations for an affiliate program. In Part One, managing program pre-launch expectations for merchants will be discussed and why it is important to make sure the merchant and the affiliate management team are on the same page. Why do some merchants have unrealistic expectations for their affiliate programs? For some affiliate marketing is a new venture, or they have heard how other merchants have had great success with their products/services using affiliates marketing. Either way, the merchant must understand the difference between unrealistic and realistic expectations and defining them up front is essential to the success of any affiliate program. It begins with the set up process of the affiliate program. When initially communicating with a merchant, one of the first things to be discussed is their expectations for the affiliate program. Are their expectations in line with what the affiliate management team is capable of doing? If their goals for the program are too high they need to be informed and an attempt to lower them to a more acceptable level is needed, but that is not always as easy as it sounds. The reason being is that they may have heard other programs had great success at the beginning and they are expecting the same results, however, the merchant needs to understand that every affiliate program is different and comparing theirs to other programs should be avoided even if they are direct competitors. The next topic to discuss with the merchant in the set up process is their website. It is the most critical piece to an affiliate program. It should be functional and all landing pages should be optimized to their fullest. With that being said, some merchants do not realize that their site could be the largest roadblock to affiliate program success, but refuse to make recommended changes because they like the way it looks. No matter how nice the site looks, if the landing pages are not optimized properly, traffic sent by affiliates will not convert. Managing website expectations is vital to a merchant and their success in affiliate marketing. The third topic to discuss with merchants in the set up process is their expectations of sales. Two of the biggest questions asked by merchants before their program goes live are: 1. When will we start seeing sales? 2. What are your projections for the program? Let’s start with question # 1: It all depends on how quickly affiliates are recruited into the program, activated and optimized. Once affiliates are active, optimization is needed to ensure they are motivated to keep promoting their product/service. The previously mentioned steps take time and merchants need to understand that it takes approximately 1-2 months to start seeing results from affiliates. Now onto question # 2: Making projections for an affiliate program can be slippery slope, but it all comes back to expectations set forth by the affiliate management team hired to oversee the program. The biggest piece to the projection puzzle is the website. If it is new or does not convert well, then projections may not be what originally expected, therefore, showing the merchant everything that is involved in starting and managing an affiliate program is essential to the success for everyone involved. Affiliate programs take time to grow, which may be scary for some merchants, but it is just a fact. Check back next week for part two of Managing Merchant Expectations for an Affiliate Program, where 3 more critical pieces will be outlined to ensure merchant expectations are kept in check once their affiliate program is launched.